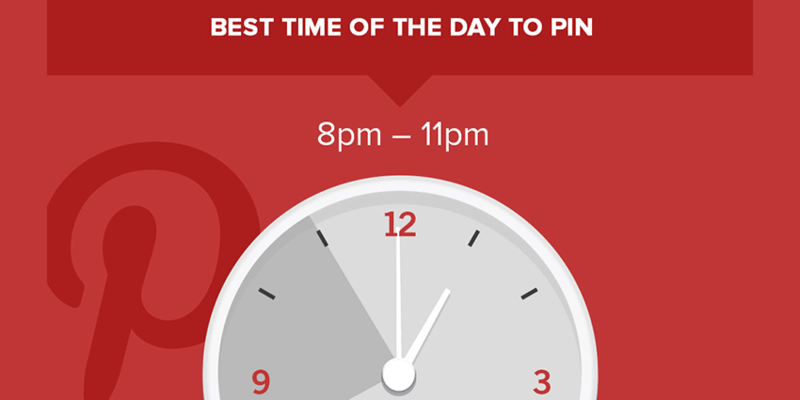 Wondering the best time to Pin on Pinterest? Pinterest is such an important platform for website traffic. It’s my top social media traffic referrer! 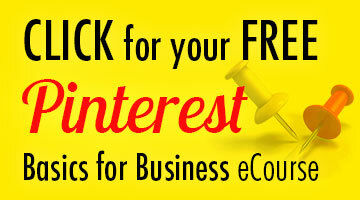 This site currently receives a minimum of 25,000 visits from Pinterest each month. How important is the best time to Pin? Due to Pinterest’s Smart Feed, not all Pins are seen at the time they’re posted. However, the perceived quality of a specific Pin is an important factor in the Pinterest algorithm, and its decision on whether that pin should be added to the Smart Feed. Pinterest is looking for signals of user engagement in order to rank your Pins. If your content is posted at a time when it’s likely to get in front of the right people when they’re ready to engage with it, you are sending a powerful signal to Pinterest that they should show it now, often, and to more people! If your Pin flops initially because it’s posted at a bad time, Pinterest takes that as an indication that it may not be of good enough quality to be worthy of the Smart Feed. Repeated signals like this over time will affect how Pinterest views all of your content. So Pinning at the right times isn’t just important to the success of what you’re Pinning now, but everything you’ll Pin in the future! Since Pinterest functions as a search engine, users can (and do!) find Pins that were posted at any time, through the search bar. Social media users are more likely to search on Pinterest than any other network. It’s more likely they’ll be shown Pins that are popular, though. By posting at a good time of day, you’ll get an authority boost in the Pinterest algorithm. Will these “best times to Pin” work for my business? 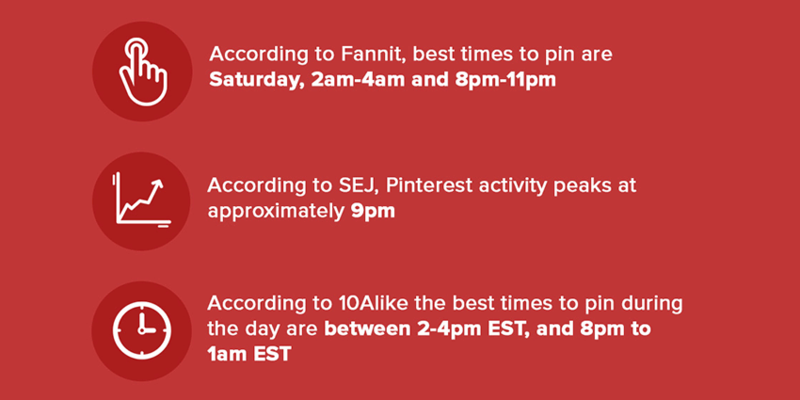 According to Fannit, the best times to pin are Saturday at 2 to 4am and 8 to 11pm. This somewhat coincides with SEJ’s peak time of 9pm, and 10Alike’s time of 8pm to 1am Eastern. 10Alike has also found 2 to 4pm to be a good time. I’ve often heard Saturday mornings are a great time to pin, but I haven’t found that a particularly good time for me, as business-to-business. Most people aren’t looking to do business-related stuff on a Saturday morning. I do find weekday evenings good, however. To be honest, a study using stats from all kinds of businesses is not very likely to find the best times to Pin for your business – or my business. Some times may work, some won’t. People love these studies, and will read and share them like crazy – so they’ll continue to be done, written up, and promoted. We’d all like an easy answer. But there’s just no one-size-fits all Pinning schedule. How can I find my best times to Pin? It’s actually easier than you think – if you’re willing to make a small investment in Tailwind. Tailwind has a built-in feature called SmartSchedule that helps you Pin when you’re most likely to get engagement. SmartSchedule suggests the best times to post based on your industry, your account, and the activity on your Pins. As an official Pinterest partner serving over 100,000 businesses, they have access to a ton of data across many industries. They crunch the numbers and make suggestions on which times are best for your account. You can take their advice (it’s so easy!) or customize time slots if you prefer. Tailwind is my secret weapon for Pinterest, and a major factor in my success there. Want to see the SmartSchedule in action? Try Tailwind for free! Tailwind analyzes your own best times to pin, and pins for you! So you don’t have to Pin at odd hours. Let Tailwind do it! And it’s fully endorsed by Pinterest. This post was originally published in February 2015, and updated August 31, 2017. The Google+ post contains all the data references. 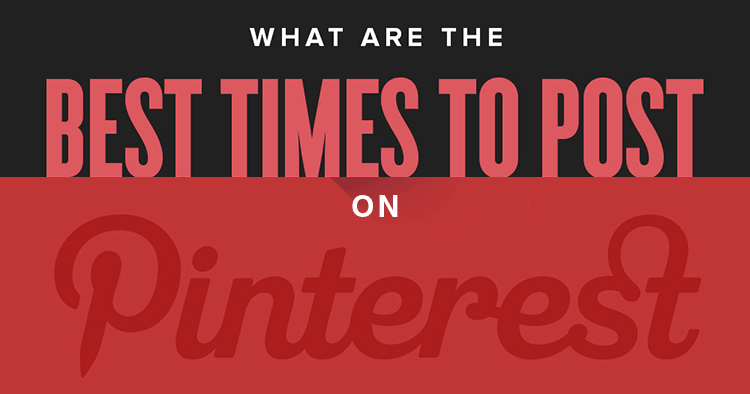 For this post, don’t wait for the best time to pin on Pinterest. Go ahead and pin it now! Surprising! Good thing I am a night owl. Is this Eastern Time? EMT? Thanks for the info. Your pictures are great Louise! Generally you’d go with the time zone where the majority of your audience resides. For global businesses with an English-speaking audience, that would usually be Eastern time! We’re just building our Pinterest brand up, so this is handy. Will test out the Saturday hours & see if they have an effect on our stats! Pinterest is very powerful! I hope these tips help you make the most of it. Best of luck! What’s the Best Pinterest Pin Size 2019? Pinterest Group Boards, the Good & Bad! What’s Up with Hashtags on Pinterest?